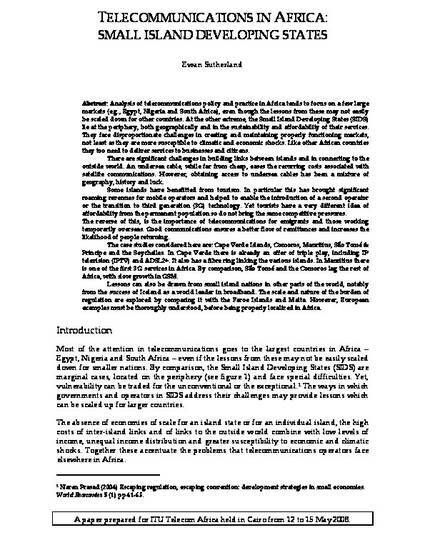 Analysis of telecommunications policy and practice in Africa tends to focus on a few large markets (e.g., Egypt, Nigeria and South Africa), even though the lessons from these may not easily be scaled down for other countries. At the other extreme, the Small Island Developing States (SIDS) lie at the periphery, both geographically and in the sustainability and affordability of their services. They face disproportionate challenges in creating and maintaining properly functioning markets, not least as they are more susceptible to climatic and economic shocks. Like other African countries they too need to deliver services to businesses and citizens. There are significant challenges in building links between islands and in connecting to the outside world. An undersea cable, while far from cheap, eases the recurring costs associated with satellite communications. However, obtaining access to undersea cables has been a mixture of geography, history and luck. Some islands have benefitted from tourism. In particular this has brought significant roaming revenues for mobile operators and helped to enable the introduction of a second operator or the transition to third generation (3G) technology. Yet tourists have a very different idea of affordability from the permanent population so do not bring the same competitive pressures. The reverse of this, is the importance of telecommunications for emigrants and those working temporarily overseas. Good communications ensures a better flow of remittances and increases the likelihood of people returning. The case studies considered here are: Cape Verde Islands, Comoros, Mauritius, São Tomé & Principe and the Seychelles. In Cape Verde there is already an offer of triple play, including IP television (IPTV) and ADSL2+. It also has a fibre ring linking the various islands. In Mauritius there is one of the first 3G services in Africa. By comparison, São Tomé and the Comoros lag the rest of Africa, with slow growth in GSM. Lessons can also be drawn from small island nations in other parts of the world, notably from the success of Iceland as a world leader in broadband. The scale and nature of the burden of regulation are explored by comparing it with the Faroe Islands and Malta. However, European examples must be thoroughly understood, before being properly localized in Africa.